Do You Get More Money When You Hire An Attorney? The results of a 1999 study from the Insurance Research Council (IRC) suggest that the decision to hire an attorney pays significant dividends for accident victims pursuing an auto insurance claim. According to the Consumer Panel Survey of Auto Accident Victims, “Paying for Auto Injuries,” settlements for accident victims were 40 percent higher with the assistance of an auto accident attorney than without it. As a result, we have seen a dramatic increase in the number of people who hire an attorney to handle their insurance claims. In a separate yet related report from the IRC titled “Auto Injuries: Claiming Behavior and Its Impact on Insurance Costs,” researchers analyzed how attorney representation relates to compensation from insurance companies for injury victims. The report found that 85 percent of all the dollars that are paid out by insurance companies for bodily injury claims are paid to clients who have hired an attorney to represent them. to handle his or her claim. a higher rate of reimbursement per dollar of economic loss. 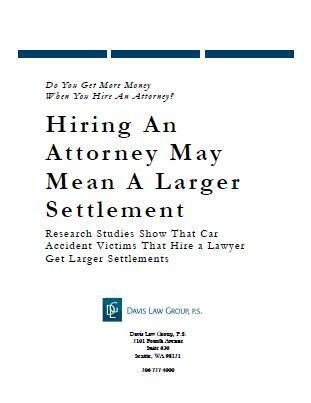 Davis Law Group founder, attorney Chris Davis, has recently authored a report entitled Hiring An Attorney May Mean A Larger Settlement which analyzes data from several industry studies. The PDF report is available for free.